1. Start a spending freeze or at least stop all unnecessary spending. This is one tip you can implement right away. No unnecessary spending for at least a week, but a month would be more ideal. You should sit down and make a list of necessary purchases. Be severe and strict about the spending freeze. 2. Start a budget or rework the budget you have. Sometimes our budgets work until they don't. Sometimes our finances change so much that we just need to rework the budget or start over with a new budget. That happens. You need to sit down and write down all income and expenses and make a workable budget. You might have to tweak the budget for a few months until you get it right. You also need to remember to plan for future expenses so you are saving for them. 3. Say no to yourself and your kids. The budget doesn't work if you do not practice self-control and self-discipline. Sit down with your family and discuss what is going on with your finances. You will not need to tell your kids all the details. Just let them know that you will not be spending money on anything unnecessary. However, you also need to tell them that they can come to you with any requests or concerns because they may need something necessary and you don't want them to be scared to ask. 4. Watch and read anything and everything you can find on extreme frugality. You are going to need the tips from it. There may be some things you don't think you can do, but you can save a lot of money if you need to. 5. Take inventory of what food you have. If you are finding your finances to be really tight, now is the time to dip into your food storage. One area of your budget you can really skimp and save on is your grocery budget. Start using your food storage, eating more from the garden, cooking from scratch and stretch your food as far as possible. 6. Comb over your bills. Where exactly is your money going? Are you paying for multiple same or like things? Do you really need satellite/cable television along with streaming services? Are you paying for things you are not using? Are you paying for unlimited data on your phones and internet at home? Make the necessary eliminations and move forward with the saved money. 7. Buy used before new. Your kid needs black pants for a school event? Go to the thrift store first or ask friends. There is no reason for you to run out and buy a new pair when you can buy used. You need to develop that mentality for this financial reset. Be sure you borrow or buy used anything you can in order to save or not spend money at all. 8. Sell what you don't need. You need the money back into your budget. You probably have debts that need to disappear. What do you have that you don't need? A lot of people have more vehicles than they do drivers. Sell the extra vehicles or, if you can, reduce down to one vehicle. You will save money on insurance and maintenance that way. What do you have that you can sell otherwise? This would be a good time to declutter and sell off the excess. 9. Shop around for insurance and other services. More often than not, you are paying for more insurance than you need. You are also probably paying higher premiums. Insurance companies rarely reward customers for loyalty anymore. Shop around for a cheaper rate. You can do this yourself or use an experienced independent agent to get the job for you. If you are driving a vehicle older than ten years, consider dropping down to minimum insurance. 10. Are you renting or purchasing your home? Are you paying for way more space than you need? Sometimes we do want the nicer things in life and our housing situations are no different. However, by moving to a less expensive place, you could be saving a lot of money and helping your budget significantly. There is no reason to be impressing the Jones at this point in the game. Don't think your home will sell or you can get out of your lease? You could move and rent your home for the cost of your mortgage payment or sublease your rental for the same cost. Just a thought. 11. Now is a good time to re-examine what gives you joy in life. Many people have expensive hobbies which cost money to do and to maintain. If you can't hardly afford your bills and groceries, the motorcycles, boats, trips, and more need to go. Selling them would help to pay more debt and build up your savings. You also need to think about how much you drink, smoke, gamble, and other addictions. They all cost a lot of money over time and your budget (and you!) would be better off without them. 12. Unsubscribe and delete anything that will derail your restructured budget. I do mean anything that will tempt you. You think you can look and resist. Then comes the rabbit hole. Throw away any flyers that aren't grocery flyers. If you really need to look at them, you can always look them up on the internet. Immediately delete and unsubscribe from all the sites that tempt you to look. Your budget will thank you! 13. Even though you have set a strict budget, it is hard to stick to it for a while. Many people have success with the cash envelope system. You put a set amount of money into the cash envelopes and you stick to that amount. When the cash is gone, you are done. If you find yourself absolutely needing more cash, you probably need to re-examine how much money you have put away for that category. Your budget probably needs to be adjusted. 14. Use the 7-day rule. If you really think you need to purchase something, commit to waiting seven days. After seven days, ask yourself if you really need that item especially if it will derail your budget. Most often than not, you do not need the item. Some people take this further and wait 14 or 30 days before deciding to make the purchase. 15. Do not let your lifestyle define your budget and your finances. Too many people think they need to keep up appearances or maintain a certain lifestyle. This doesn't work when you are trying to reset your finances. More than likely, your "lifestyle" is what got you into the mess you are in, but you are blaming it on other things. Now is the time to let go of the life you thought you had to live so you can get right with your finances. 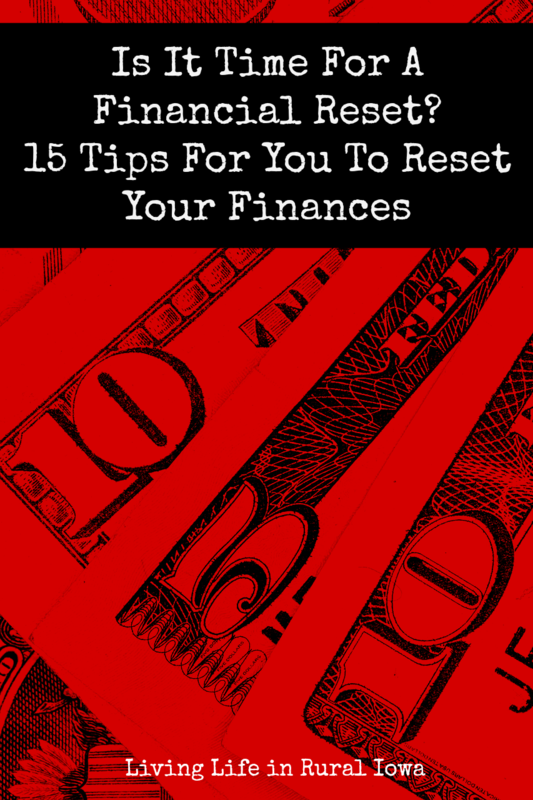 Resetting your finances can be hard. You may have to make some hard decisions to keep the wolves away from the door. However, you can do it! Is it A Need or Want? What Should You Spend Your Money On?